As we all know Ayurveda is an ancient system of medicine, which has been in practiced in India for more than 5000 years it has been exercised in many parts of India and nowadays throughout the worlds. Ayurvedic herbs are regularly used by people of India in the way as culinary spices and in various home remedies in day to day life which helps to restore illness and balance to the body. According to Ayurveda disease are the result of an imbalance in one of the three doshas which are pitta, vata and kapha. 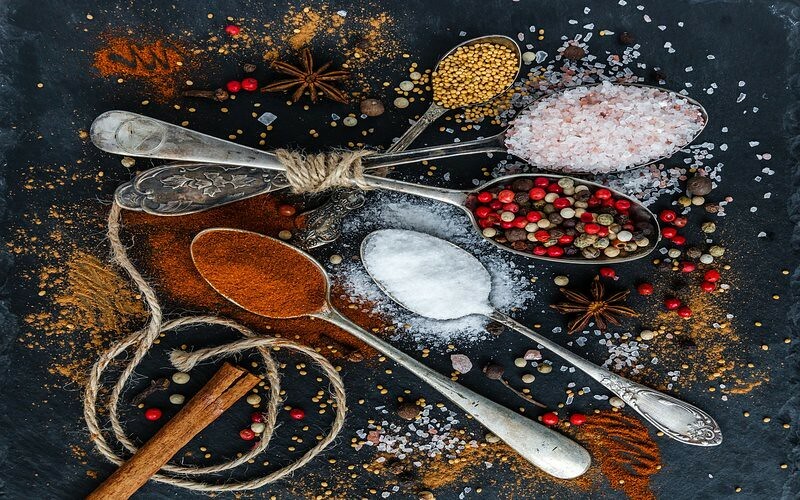 In Ayurvedic way of cooking the spices and herbs plays a very important role, it not only makes food delicious but also delving into how all the ingredients together can benefit you and your body for well-being. Each ingredient used in cooking has its unique properties and finds the ways to make the most of these benefits. Today we are going to speak of most used ayurvedic herbs used in Indian family. They can be generally found in vegetable food stores and herbal markets. Holy basil is commonly known as “Tulsi” in India, it is the most common plant found in most of the Hindu family in India. The Indian basil taste milder, unlike other varieties that belong to Thai or Italian continent. It have been described in ayurveda as a plant with healing properties and use as remedies for more than 5000 years in India. It have a properties that can cure various ailments such as cough, fever, heart diseases, skin infection, common cold with respiratory disorder etc.It also provide energy and increase our immunity system. Turmeric, or Haldi, is generally used in most of all food recipes in India it also gives to curry its golden colour. It has been used as Ayurvedic medicine for thousands of years; it is also a good example of an herb which contemporary science has understood up with. Naturally anti-inflammatory, antioxidant and unsusceptible system strengthening, it can be also capable in treating arthritis, diabetes and even cancer. Keep applying this herb for cooking and take in as drinks to stay fit and healthy. It is another herb that is widely used in Indian kitchen and used in cuisine. The leaves are generally used in dry form and easily available in market. It is an aromatic leaf with slightly sweet taste similar to cinnamon and widely used as flavor in kitchen for “Tadka” and also known for its medicinal properties. In the kitchen, it is mainly used to tune the flavor in dals, rajma, biryani, chole, curries etc. Bay leaves are generally added to the dishes and cook over low heat for an hour or so to extract its flavor. It contains powerful antioxidants properties that are believed to help to prevent cancer and kidney stones. Coriander or dhanya is also related to in Ayurveda, is a common culinary herb in cooking. The fresh leaves are named cilantro, while the ground seeds are named coriander. They both include natural anti-inflammatory and pain-reducing properties. The herb is used for heartburn, irritable bowel syndrome, fevers, respiratory contagions and allergies. It is also a natural chelating agent, and has been used to help take off heavy metals from the body. Methi is also called as “Fenugreek”, is another herb that is known for its bitter taste and is commonly used in Indian cuisine. It is also used as used “Tadka” in curry, stir-fries, chicken dishes, dal etc. Its leaves are also used as filler in parathas called as “methi ka parathas”. Other popular dish in most Indian households is “Methi Aloo”, in which its leaves are used, the sweetness of the tuber and the bitter taste of the methi leaves are so matched that it creates a delight full with look and taste. It have various properties that can make us healthy by eating it such as it can maintain cholesterol and can prevents the risk of heart disease. It have antioxidants properties that can aids in digestion, beside this it is rich in fiber along with various vitamins and minerals. Garlic is respected by both cooks and herb doctors in a similar way. The Ayurvedic title for the garlic herb is Lacuna. It is a fruitful bulb that is used for various purposes. It is naturally antiviral agent, anticyclonic agent and bactericide. It has been shown to be advantageous at the common cold and flu, and help intensify immune function. It is used in both holistic and traditional medical circles to guard against heart disease and lower cholesterin. Garlic is a must-have for all of us to stay fit and healthy. The mint also known as pudina in India, it is another most commonly used herbs in the Indian kitchen. With its distinctive flavor lends itself to creating some spectacular dishes. In most Indian houses it is used in making chutney (type of sausage) and is eaten almost with every type of dishes such as parathas, rice, dal, omelette etc. The refreshing taste of mint and its cooling properties often make the choice of people to drink juices, shake and mock tails during summers. Beside its coiling properties it is also helpful to relives cough and cold, digestion, fatigue, body aches and various oral allergies. Ginger or shunti is another excellent herb, which is used as medicine and also as a cooking element. The root is used to treat anything as of circumstances such as indigestion and queasiness to more serious troubles such as arthritis. It is freely included into herbal recipes like extracts and is a great to use as a home-made remedy. Curry leaves are is an herb that is used in cuisine allover India since the ancient times. It is known to be the pride of the cuisine of southern India; its origin is to southern India and Sri Lanka. It is widely used in most of the Indian dishes such as sauteed meat, curries, stews, sambhar legumes etc. It is most used as “Tadka” for various dals recipe. Because of its general use most of the Indian plant this tree in their homes in pot or in garden. The curry leaves are bitter in taste and very aromatic in nature. The curry leaves are full of fiber and have other properties such as antioxidants, anti-bacterial and various vitamins and minerals. Cinnamon is a highly useful ayurvedic ingredient. As well as supplementing its characteristic flavor profile to various dishes it can be used to control blood sugar levels, is functioning in certain types of cancers and can decrease effects of blood clotting. It quickens circulation, particularly in the lungs and is useful for cool hands and feet, Raynauld’s, and to boost circulation in the joint space. Moreover, heating and stimulating to the liver and kidney, it impressively pacifies cold Vata and manages metabolism of fats and sugars in Kapha, helping with type II diabetes and insulin resistance. Tips: it is always advisable to buy fresh quality of herbs and spices to attain the best health benefits. The other way is that you can grow your own super foods at kitchen garden the super herbs, like Methi leaves, holy basil, pudina, Curry leaves trees, Garlic, Ginger and Turmeric can easily grown without more efforts. This species are very adaptable to a variety of different climate conditions and can be grown in many parts of the world besides their native habitat. Note: Although the above mention herbs are consider being best for health, but it is advisable to consult a certified Ayurveda practitioner for the dose of each herbs as it depend on the certain specific medical condition of the persons.